Virtual reality could soon be a practical tool for engineers with the availability of inexpensive VR equipment like Oculus Rift and free open-source design software, according to a researcher at the University of New South Wales. “I can eventually see the engineer sitting at his design board with a pair of goggles beside him,” UNSW senior lecturer John Page told Computerworld Australia. Page and other researchers from the UNSW School of Mechanical and Manufacturing Engineering have been developing simulations with the Oculus Rift headset for the last nine months. The researchers had been looking engineering applications of virtual reality for the past five years, but for a long time it had been expensive and time-consuming to design and experience virtual worlds, Page said. By comparison, Oculus Rift is cheap and easy to use, he said. “The visuals are nowhere near as good as the original goggles we used, but we’re talking about a difference in price that’s out of this world,” Page said. Using open-source programs Blender and Make Human, which cost nothing to use, the researchers can create virtual worlds and people much faster and more cheaply than had been possible before, he added. 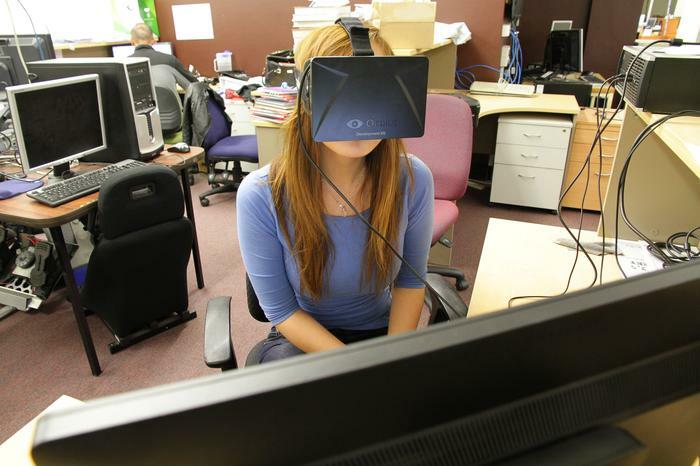 VR can teach engineers about environments that are not frequently experienced, he said. For example, UNSW has developed a simulation of a space station that demonstrates the physical effects of zero gravity, he said. 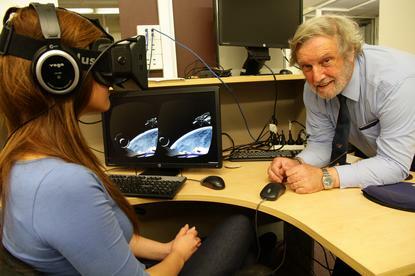 A tool like Oculus Rift can bring the stars to the engineer without great cost, he said. A look at the UNSW lab researching virtual reality. The researchers are also developing simulations of planets and asteroid mining, he said. Another potential application for Oculus Rift could be to simulate factory processes with the goal of improving efficiency, said Page. Page added that VR could additional be used for a virtual museum or library of engineering artefacts, he said. For example, a car designer could use goggles to quickly inspect a variety of cars from different eras, walk around them and look inside, he said. Page said UNSW will receive the new version of Oculus Rift this month and he expects that to improve several of the product’s weaknesses. One important new feature is motion recognition of bending forward, a movement that is natural for inspecting objects in a virtual world, he said. Facebook’s acquisition of Oculus is unlikely to affect the UNSW research, said Page. Page said he’s looked at information on Sony’s rival virtual reality headset, but has not tested it himself. However, he said that the Sony product appears to be targeted at gaming only.